According to advertisements, there are two scoops of raisins in every box of which cereal? 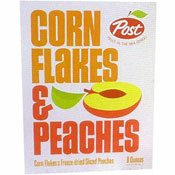 This Post "Fruit-In-The-Box Cereal" from the mid-1960's was described on the box as "Corn Flakes & Freeze-dried Sliced Peaches." One short television ad noted: "Now even when there's snow... peaches go with corn flakes. Now! Post Corn Flakes & Peaches!" This product was part of the Post Real-Fruit-In-The-Box Cereal line which also included Corn Flakes & Strawberries and Corn Flakes & Blueberries. What do you think of Corn Flakes & Peaches? I do not remember having this version but it sounds good. I loved the blueberry and strawberry ones. I think it was still around in the late 60's/early 70's. Please manufacture Corn Flakes & Peaches cereal again! There hasn't been anything like it since it went away. This is the best of the three freeze dried fruit / cornflake combinations. I loved the thin slices because the milk permeated the fruit well so it was pretty close to fresh fruit. Not so with the strawberries. The blueberries were particularly bad and tasted like little nuggets of wood. 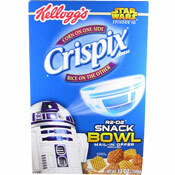 This is my second all-time favorite cereal, right after Frosted Rice Krinkles! Could be my most favorite of all time. Out of the three Cornflake and freeze dried fruit combos, this was the worst because every box had very few peach slices and they were very thin sliced.